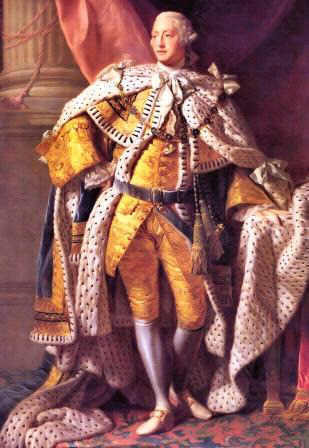 The Proclamation of 1763 was issued by the British King George III whose picture can be seen from the adjacent portrait.The Proclamation of 1763 was made following the British victory over France in the French and Indian Wars. The Royal Proclamation of 1763 was perceived as being beneficial to the Native American Indians and Great Britain but as detrimental to the colonists. 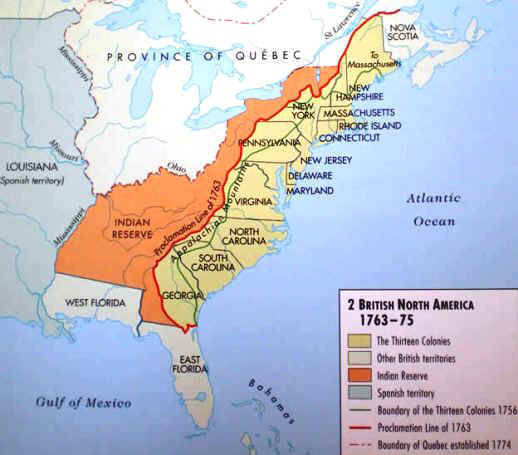 This article provides fast facts and interesting information about the Proclamation of 1763 and its significance upon the colonists and a map illustrating the massive border between the colonists and the Native America Indians referred to as the Proclamation Line. The definition and purpose of the Proclamation of 1763 and the cry of "No taxation without representation!" British Proclamation of 1763 Summary and Definition: The Royal Proclamation of 1763 was issued October 7, 1763, by King George III following Great Britain's acquisition of French territory in North America following the end of the French and Indian Wars with the Peace of Paris which concluded the Seven Years' War in Europe and the French Indian War in America. The Royal Proclamation of 1763 was designed to calm the fears of Native Indians by halting the westward expansion by colonists whilst expanding the lucrative fur trade. Refer to Royal Proclamation of 1763 for the actual words and text. The British had a financial reason for the Royal Proclamation of 1763. Their victory in the French and Indian Wars enabled them to monopolize the highly lucrative fur trade, also refer to Triangular Trade. They wanted to improve and expand trade further which involved the Native American Indians who lived on the frontier. 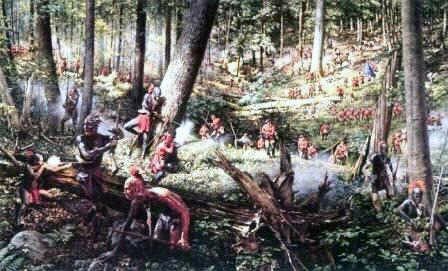 The fight to monopolize the fur trade in French territory had led to the the bloody conflict known as the Beaver Wars in 1640 - 1701 against the Iroquois Confederacy. 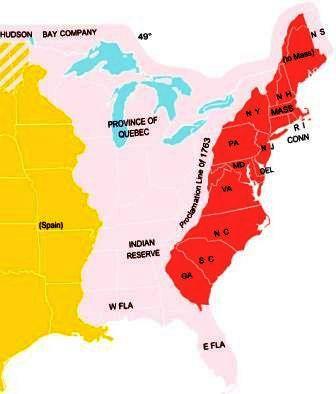 The Royal Proclamation of 1763 at the end of the French and Indian War established the controversial Proclamation Line along the Appalachian Mountains safeguarding Indian lands and territories and repaying the Native American Indians who helped the British during the war. Many of the American Indians, primarily in the Great Lakes region, had close relationships with France and were appalled to find that they were now under British control. Pontiac's Rebellion during the Pontiac War (1763–66) was an unsuccessful effort by Native American Indians to prevent Great Britain from occupying the land previously claimed by France and this hastened the implementation of the Royal Proclamation of 1763. The Royal Proclamation of 1763 was an attempt by the British crown to separate white settlements from Indian country. The colonists perceived that the Royal Proclamation of 1763 clearly demonstrated that the British King was on the side of the Indians to the detriment of the colonists. The introduction of the massive boundary, which was the Proclamation Line, would require the establishment and the manning of posts along the border. A costly venture which the British administration argued was for the defence of the colonists. It was therefore deemed that the costs should be paid for by the colonies. From the perspective of the colonists this amounted to a tax to pay for a boundary to lands that was against the interests of the British Colonies. Map: The Royal Proclamation of 1763 resulted in a massive border, or Boundary Line, referred to as the Proclamation Line, which is shown on the Proclamation Line Map. The Proclamation Line between the British colonies on the Atlantic coast of America and American Indian lands called the Indian Reserve ran west of the Appalachian Mountains and south of Hudson Bay to Florida. The Proclamation Line was not intended to be a permanent boundary between the lands of settlers and Indians, but rather a temporary boundary which could be extended further west in an orderly, lawful fashion. The British colonists vehemently resented the Royal Proclamation of 1763 and the introduction of the concept of the Proclamation Line. Prominent American colonists joined with land speculators in Britain to lobby the government to move the line further west. As a result, the boundary line was adjusted in a series of treaties with Native American Indians. The 1768 Treaty of Fort Stanwix, the 1768 Treaty of Hard Labor and the 1770 Treaty of Lochaber opened much of what is now West Virginia and Kentucky to British settlement. Proclamation of 1763. Discover the the key years, famous people and events of the Proclamation of 1763 together with the causes and effects of the war, conflict and battle. Pictures have been include wherever possible which show the battlefield, clothing and weapons of the Colonial America and their leaders who fought in the Proclamation of 1763. The illustrated text provides a really useful educational resource for kids and children of all ages. We have included pictures and videos to accompany the main topic of this section - The Proclamation of 1763. The videos enable fast access to the images, paintings and pictures together with the information and the many facts featured on this subject of the Proclamation of 1763.